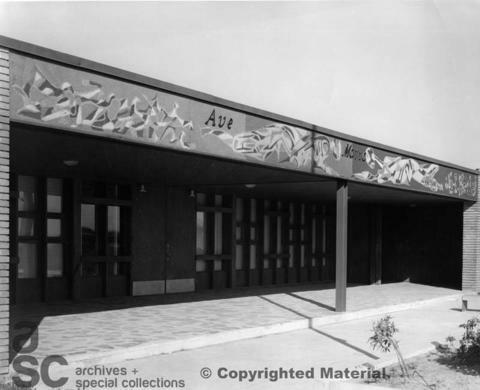 Photographs of the exterior of the single storey elementary school building. 16 classrooms and offices are grouped around a central auditorium. View of entrance mural above main entrance painted by Adrian Vilandré. The building has a light steel structural frame with brick veneer and tongue-and-groove boards for exterior finishing. All windows are double-glazed, ceilings are perforated fibreboard, flooring is vinyl asbestos tile. "Ave Maria School, Granby, Que." The Canadian Architect January 1957: 49-52.